​Helen likes cheese. Helen likes cake. But Helen doesn't like cheesecake. 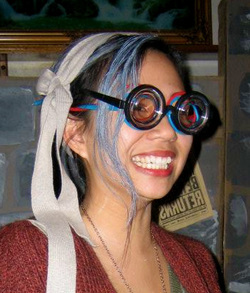 Helen studied Chemistry and Chemical Engineering at UC Berkeley. She previously conducted research with Prof. Tsu-Jae King Liu (Electrical Engineering, Berkeley), Prof. Christopher Schuh (Material Science, MIT), and Dr. Ronald Zuckermann (Molecular Foundry, LBNL). Outside of lab, she enjoys sculpting clay, painting, origami... and basically all sorts of arts and crafts to make handy-dandy unique objects. I suppose that's why she super enjoys her current research in designing novel, functional and self-assembling block copolymers. It is arts and crafts at the nanoscale!